The key to long-term performance of a roofing system is knowledge of the roofing system, periodic inspection and routine preventive maintenance. A professional roofing contractor best provides this service. Right from the beginning, a proactive approach to inspection and maintenance can protect your investment and maximize the useful life of your roofing system. Certified Roofing Systems and Contracting Corp. is proud to offer this service to its customers. We are going above the industry standards to provide you with all the assistance in maintaining a healthy roof. PMIP is available for any new roofing system, re-roofing, or renovation project installed by and/or serviced to the satisfaction of CRS Roofing Services. 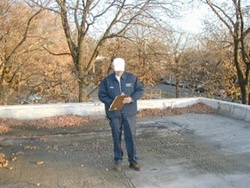 Receive a detailed report of current roof system conditions. Receive a scaled drawing of the entire roof system. Receive digital pictures of existing conditions and status of current roof system. Be added to CRS’ computerized system, which will track the running costs, work details to date and pertinent information required by the manufacturer. This will help provide a historic overview of your roofing system. Receive assistance by our roofing professionals to help other contractors deal with leaks that are unrelated to roofing. Be provided follow-up inspections to ensure maintenance management is continuous. Annual inspections are recommended, and will be conducted upon your authorization. There is no charge for PMIP on CRS installed roof systems. However, in other cases, there may be a one-time setup cost based on the roofing system’s condition, roofing area number of levels, number of penetrations, estimated foot traffic, and type of roofing assembly. After our initial setup, subsequent repairs will be billed at a reduced rate. Click Here to Learn about CRS Roof Asset Management Programs.